The St. Martins Craft Guild is an independent organisation which meets from 2 – 4pm on Wednesdays in the Chapter House of the parish church. It is open to anyone from the St. Martins area. There is no joining fee but a small donation is requested to cover costs of refreshments. The group aims to share and enhance the skills of its members in an informal setting, and its skills are available to other groups in the village. New projects would be gladly considered. We also make donations to charities and good causes. Over the last few months St.Martin's Craft Guild have been busy making items for The Kenyon School Project. 82 items will be handed over to a representative of the project at the end of July 2012. 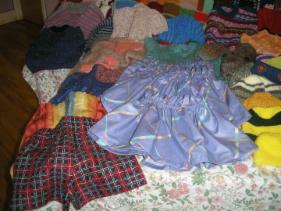 The 82 items consist of 35 knitted hats, 24 knitted cardigans and jumpers, 4 skirts, 4 trousers, 2 dresses and 13 woollen blankets. The Craft Guild is always looking for donations of wool if anyone has any spare full or part balls of wool they do not require we would be pleased to accept them for future projects. Donations can be handed in to the Craft Guild on Wednesday afternoons at the Chapter House at the church between 2 and 4 p.m. excluding August. The St.Martins Craft Guild has been busy over the past few months. 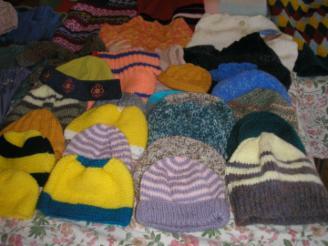 84 Blanket squares and 25 hats have been donated through the Border Angels Charity Knitting Group to the Charity Knit-a Square. This Charity, started in Australia, benefits AIDS orphans in South Africa. 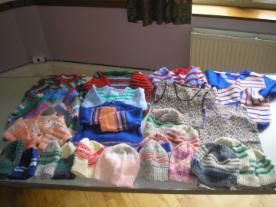 A further 15 hats and 12 children’s sweaters have been donated to the Kenyan Schools Project, run from Ellesmere. St.Martins Craft Guild meets on Wednesdays from 2 – 4 p.m. in the Chapter House at St.Martins Parish Church. New Members are always welcome. The next Project will be making gifts for Easter.